128 pages in A4 Portrait mode, many period photographs and walkaround ones, colour profiles and model details. 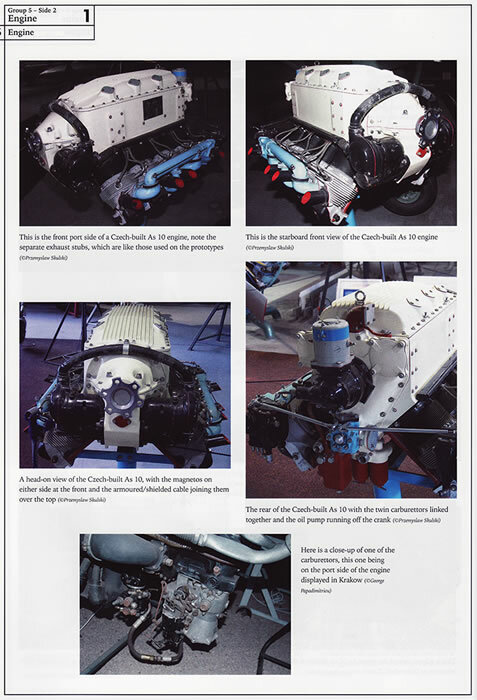 Advantages: Detailed and comprehensive look at the Storch. Great colour and B&W period photos, good line drawings and current walk around photos. Dedicated modellers section. 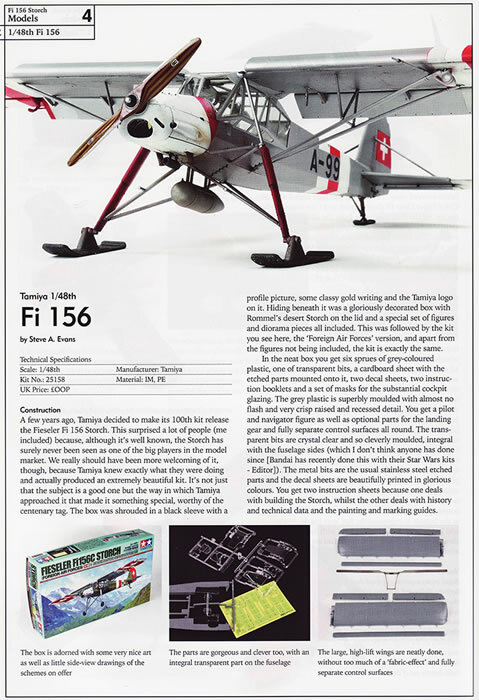 A great, should have, reference for modellers of all scales interested in the Fi-156 Storch aircraft. 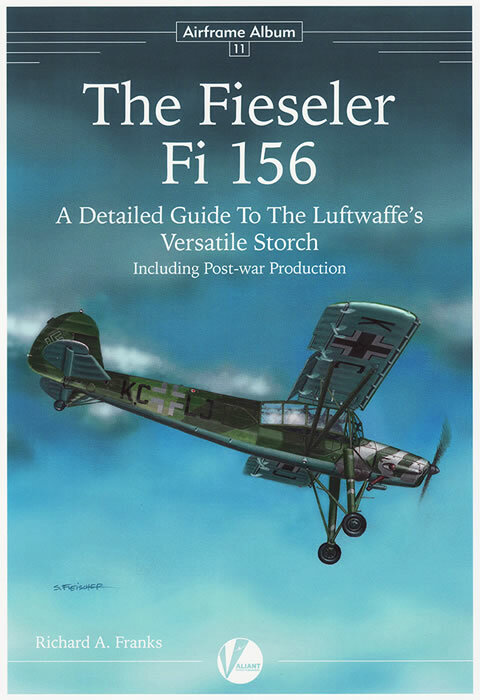 The now released 11th instalment of Valiant Wings, Airframe Album series, is titled The Fieseler Fi 156: A Detailed Guide to the Luftwaffe's Versatile Storch. 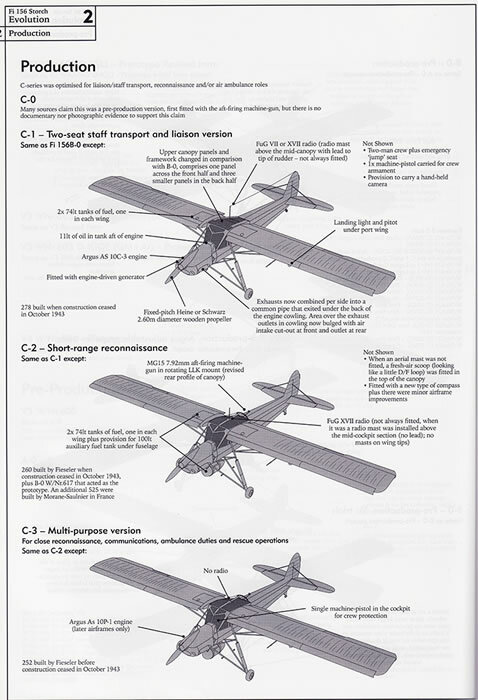 It is authored by Richard A. Franks, a well-known name in modelling and aviation publishing. This book contains a great wealth of period photographs of the Storch in action during the war. Included are a number of rarer colour photographs which will provide great modelling references. The photographs selected are all clear and crisp in nature, with details clearly visible. 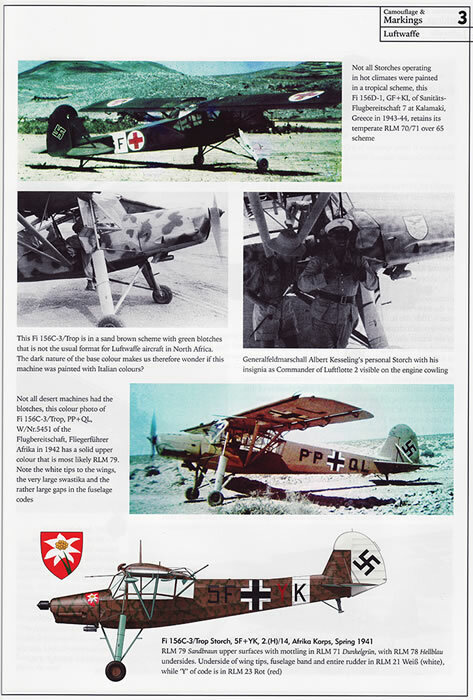 There are quite a number of coloured profiles produced by Richard Caruana, illustrating the many schemes of the Storch in Luftwaffe service and in liveries of many of the nations that also used this versatile little aircraft. Complementing the photos and profiles are numerous 3D isometric line drawings by Chris Sandham-Bailey. The Technical Description section of the book covers the airframe quite comprehensively from nose to tail. The cockpit and engine section.is jam packed with period photographs, technical drawings, excerpts from Fi-156 manuals and photos of restored examples. These sections have provided that special emphasis for details that will be of most interest to modellers. The Evolution section on the airframe gives a very clear overview of the development of the Fi 156, from the initial prototypes and pre-production airframes, right through to the French- and Czech-built post-war variants. The Camouflage and Markings section provides many schemes used by the Luftwaffe over the pre-war period until the end of WWII. Included are schemes for captured aircraft, as well as for the nations that had procured the airframes for their services. The Markings also cover the further development and use of the Storch after the end of WWII. I must admit, I had no idea until reading the book that so many nations had flown this aircraft. 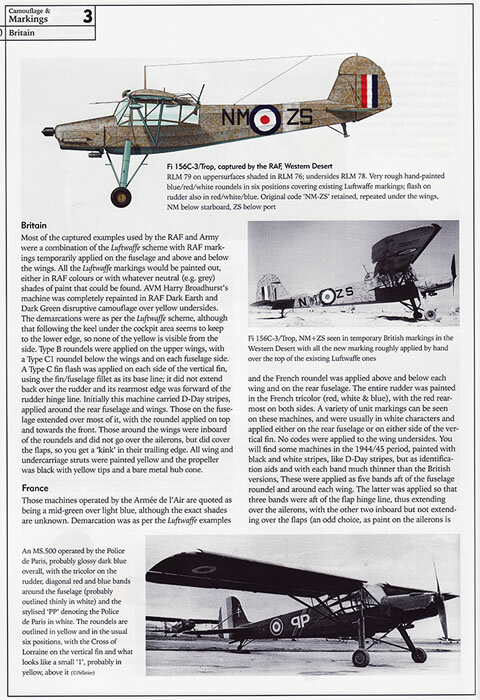 The last section of the book covers the specially commissioned kit builds, showing construction and conversion of a number of Storch models. Kit builds include the Smer (ex-Heller) Fi 156C and a conversion of the Academy Storch to a K-65 Cap in 1/72nd by Libor Jekl, plus the Tamiya 1/48th example by Steve A. Evans. 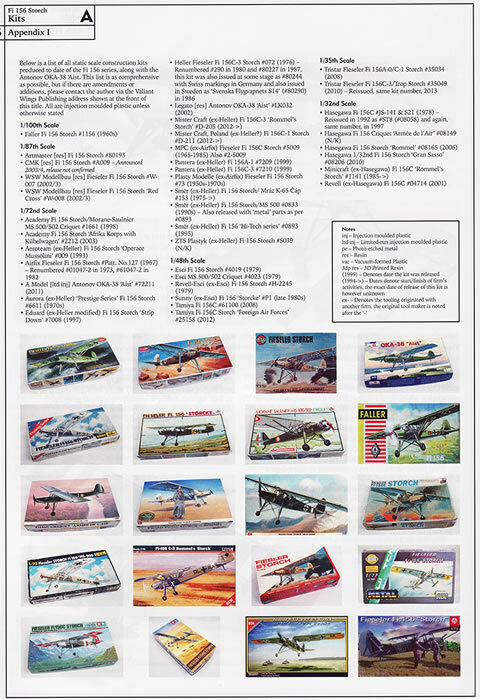 The Appendices, again specifically for modellers, lists all Storch kits available, accessories and decals produced in all scales. Unfortunately you will see not much in the 1/32 lines, with much more in the 1/72 and 1/48 scales. 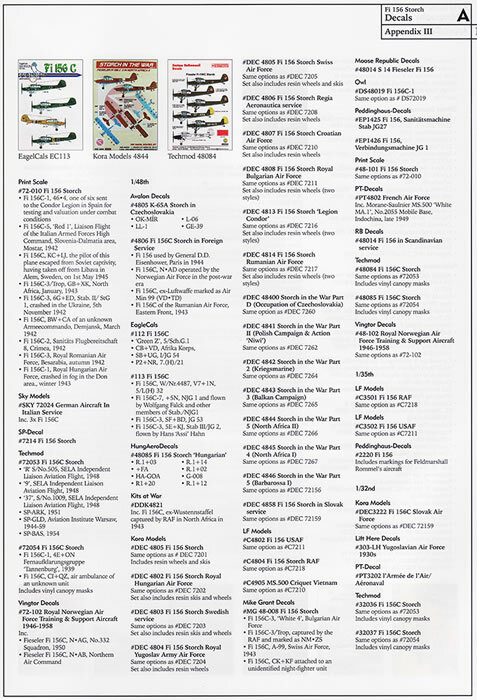 For those interested the main kits would be the Hasegawa (1/32nd), Tristar (1/35th), Esci or Tamiya (1/48th), Academy or Airfix/Heller kits in 1/72nd scale. 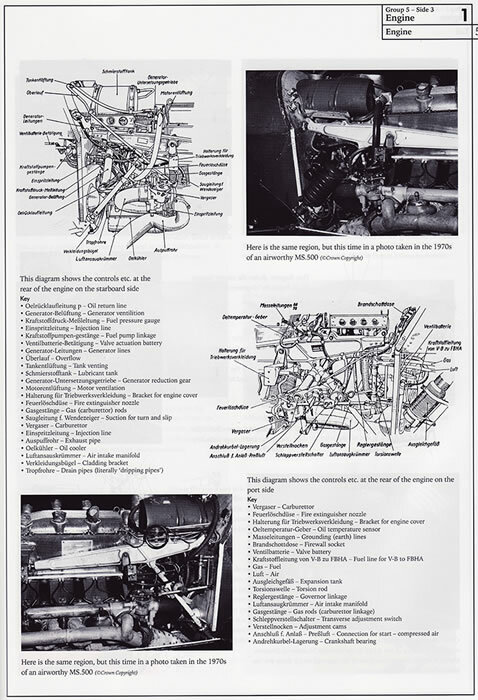 It was also good to see that there is also a bibliography including all previous book titles for the Fieseler Fi-156 Storch so you may chase up further information for your references. This book has been deliberately produced for the modeller, providing an absolute wealth of reference photographs and detail, profiles and anything else one could wish for to produce and accurate, and even different, Storch. 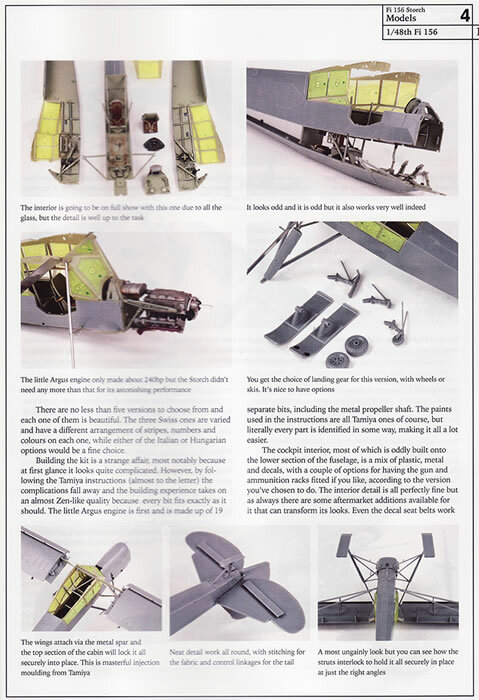 This is highly recommended to all wishing to build the Storch in any scale and I wish there was one like this for all major aircraft types. Thanks to Valiant Wings Publishing for the sample.